(APN) ATLANTA — In a surprising turn of events, the Atlanta City Council voted down Mayor Kasim Reed’s nomination of disgraced former Councilman Lamar Willis (Post 3-at-large) to the Fulton County/City of Atlanta Land Bank Authority. Willis lost his City Council seat to Andre Dickens in 2013 after serving for twelve years, during which time he committed numerous ethics violations and was disbarred for stealing thousands of dollars from a child he represented as an attorney. As APN reported, Willis’s appointment was approved by the Community Development and Human Resources Committee on June 09, 2015. But Willis did not fare as well at the City Council Meeting on June 15, 2015. Several people spoke out about the appointment during public comment. “We all know what this is really about. This is about to be a fire sale of Castleberry Hill and Vine City and English Avenue properties,” Snapper Mack, a member of the Castleberry Hill Neighborhood Association, told the Council. Mack serves on the Community Benefits Plan Committee, which makes recommendations on how to allocate funds set aside from the Falcons stadium project for job training and other programs. The Land Bank Authority currently holds at least six properties in the Vine City and English Avenue neighborhoods. Willis’s formal external affairs manager, Lawrence Bell, spoke in support of the appointment. “I believe that there is no more better, qualified person to serve on such a committee that can really maximize the assets of our City,” he said. William Perry, director of Common Cause Georgia countered that notion in his public comment. “I think there are plenty of opportunities for [Willis] to serve the City outside of being appointed to an authority that makes important decisions where people would have the opportunity to try to bribe somebody on a commission such as this. This is not a small appointment, this is an important appointment that makes important decisions and is one that we should not take for granted,” Perry said. 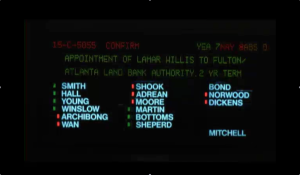 When the motion to appoint Willis came up for a vote, Councilwoman Keisha Lance Bottoms (District 11), who approved the appointment in Committee, made a substitute motion to table it. “Given the lengthy amount of discussion that surrounded this nomination, I just ask that we hold this so we can give this the ample discussion and consideration that it needs,” she said. Her motion failed nine to five. NAYS: Archibong (District 5), Wan (District 6), Shook (District 7), Adrean (District 8), Moore (District 9), Norwood (Post 2-at-large), and Dickens. Councilman Michael Julian Bond (Post 1-at-large), who had previously supported the appointment in Cmte, was excused. With seven votes for and seven votes against, Council President Ceasar Mitchell broke the tie. “Mine is a nay vote, so the motion fails to confirm,” Mitchell said. Wow this known crook should be appointment former Attorney and thief! No Way in hell should he be on any committee beyond the PTA and that is probably a stretch with his thieving behind!!!!! Are you sure Bond was excused? Just like Cathy Woolard, yawn, did anyone even notice her way advance run for Mayor. Sorry you put down Mary, Support Kasim, birds of a feather flock together. We want real leaders not follow the Leader: Woolard.